We always decide on our dog, Avon's, costume first. This year he was a bull for Halloween. We took it a step further and added a lei to his neck to make him into Ferdinand the Bull. His horns are made from paper mache. I used tinfoil to create the shape, then added masking tape, and paper mache (newspaper, flour, water). Lastly I painted them with puffy paint and tied them to a headband with brown yarn. His hooves are made from cut and painted styrofoam cups. Staying on theme, my husband, Shawn, and I decided to be a matador and flamenco dancer, respectively. 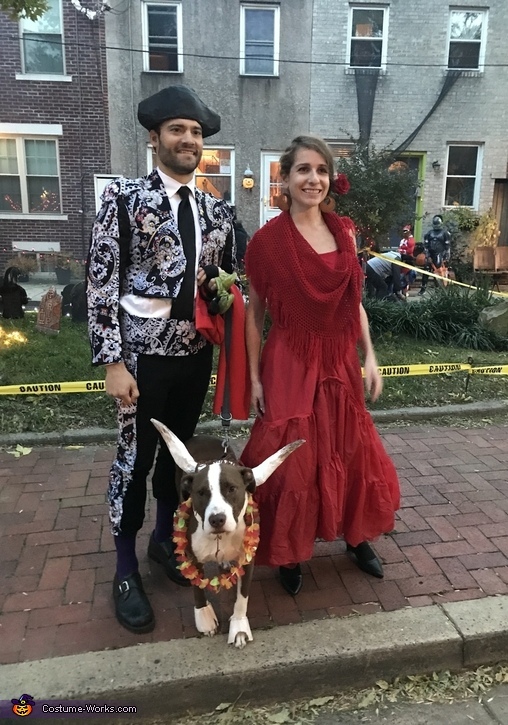 The matador costume ended up stealing the show. To create the costume, I went to the thrift store and bought my husband a black suit jacket and black women's capris. I cut and hemmed the jacket to look like a matador jacket. I then went to a local cheap fabric store (Jomar) and bought three yards of fabric for under $4. I used no-sew fabric glue to affix the fabric onto the jacket and on the sides of the capris. I bought shoulder pads ($1) and covered them and a cardboard cummerbund with the same fabric. Once the glue was dry, I embellished the fabric on the jacket and capris with puffy paint and hot-glued sequins. I found red fabric and safety pinned it to the sleeve of the matador jacket to represent the red cape. Lastly, I created a matador hat out of paper mache and painted it with black puffy paint. For my flamenco costume, I went to the thrift store looking for a ruffle-y red dress. I found the inside of a wedding dress for $3 and dyed it with red dye ($4). The rest of the outfit comprised of clothing I already had at my house. I had to buy odds and ends like the fabric glue, puffy paint, and flowers for my hair. The total cost of the costume was under $20 and we got so many compliments from tricker treaters and requests for children to pose with us. The best compliment was when a man from Galicia, Spain actually thought that we were Spanish because of how authentic the suit looked!